Lorain County Public Health (LCPH) works with communities, schools, colleges, worksites, and faith-based organizations to pass tobacco or smoke free policies. Find out what your community can do and email us with tobacco-free policy questions. Tobacco free policies are not "smoker-free" policies. People who use tobacco products may still choose to do so - just not in areas with policies that restrict using cigarettes and other tobacco products. These policies are like policies that restrict open containers of alcohol in most public areas. Tobacco-free policies get customized by location. Download our tobacco-free policy checklist to guide you through creating a tobacco or smoke free policy in your community. Keep scrolling to view policies from around Lorain County. Policy VI-225: 100% Tobacco-Free Institution (A) Lorain County Community College is designated a 100% tobacco-free institution. Purpose: LCCC is committed to promoting a healthy lifestyle and workplace environment and will support administrators, faculty, staff and students in their efforts to reduce or discontinue the use of tobacco products. The College has adopted a 100% tobacco free policy that supports a healthy environment for all. The primary emphasis of this approach is to focus on the elimination of tobacco and all smoking simulating device use on all College property with cessation left as a choice for the individual. (B) Replaces 3354:3--VIII-8.00, dated July 28, 1988, approved December 15, 1988, revised and approved July 30, 1992; revised and approved June 26, 2014; revised and approved June 23, 2016. (1) Avon Lake parks are primarily intended for the use and enjoyment of the residents of the City and their friends. Persons not residing in the Municipality are guests and are extended the privileges of the parks, provided they do not abuse the hospitality or rules of the City. (2) As used in Sections 1070.02 through 1070.07, "parks" means those areas owned or managed by the City that are used for park and/or recreational purposes, including City parks, playgrounds, beaches, fields, wildlife preserves and those public park areas which have been set aside by allotters for recreational and/or park purposes. (3) As used in Sections 1070.02 through 1070.07, "Recreation Department" means the City's Department of Recreation. (4) As used in Sections 1070.02 through 1070.07, "Director" means the Director of Recreation. (5) As used in Sections 1070.02 through 1070.07, "sunrise" means the time of day provided by the Astronomical Applications Department of the U.S. Naval Observatory as the time for sunrise on that day in the City. (6) As used in Sections 1070.02 through 1070.07, "sunset" means the time of day provided by the Astronomical Applications Department of the U.S. Naval Observatory as the time for sunset on that day in the City. (7) As used in this section, "tobacco" shall have the meaning given to it in Section 667.01 of the Codified Ordinances. (8) As used in this section, "smoking" shall have the meaning given to it in Section 667.01 of the Codified Ordinances. (u) Use of Tobacco Prohibited. 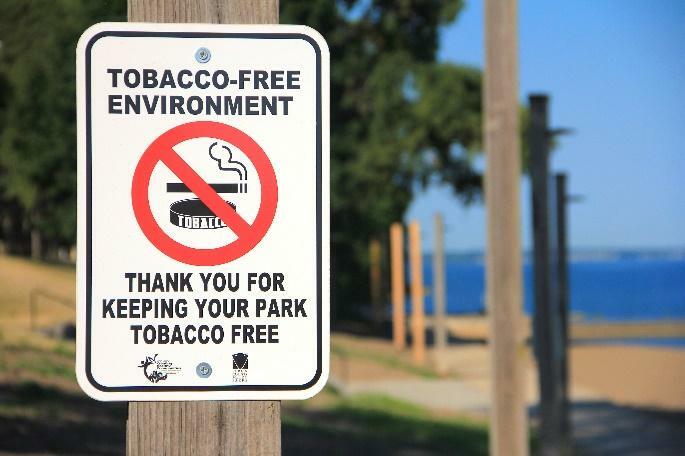 The smoking or use of tobacco in parks is prohibited. (A) "Employee" means a person who is employed by the City of North Ridgeville, with or without compensation. (B) "Place of employment" means an enclosed or open area under the direct or indirect control of the City of North Ridgeville that the City’s employees use for work, or any other purpose, including but not limited to, offices, meeting rooms, sales, operations and storage areas, restrooms, stairways, hallways, warehouses, garages, and vehicles. The areas as described above are places of employment without regard to the time of day or the presence of employees. (C) "Public place" means any city-owned, rented, or leased, enclosed or open area incorporating or part of a City facility, City park area, or any other City premises to which the public is invited or in which the public is permitted. (D) "Visitor" to public City facilities or related areas, means a person who may or may not be a City resident but who for whatever reason is present at such public places as defined above, including but not limited to persons who contract with the city or third parties who otherwise perform services. (E) "Use of tobacco" means all uses of tobacco, including inhaling, exhaling, burning, vaping or carrying any lighted cigar, cigarette, pipe, vaporizer, other lighted smoking device or papers for burning tobacco, or any other plant; chewing tobacco, snuff, or any other matter or substances that contain tobacco. "No Tobacco Use" signs and/or the international "No Smoking" symbol (consisting of a pictorial representation of a burning cigarette enclosed in a red circle with a red bar across it shall be conspicuously posted in every public City facility/places/parks and City place of employment where tobacco use is prohibited by this policy, including at each entrance to the public place, City facility or park. Signs shall be of sufficient size to be clearly legible to a person of normal vision throughout the areas they are intended to mark. All violations shall be reported to City management of the particular City facility involved. Appropriate follow-up, discipline, and/or further action shall be considered by the City’s Mayor or his designee in the instance of City employees. Lorain County Public Health offers "Tools to Quit." You can access their website at loraincountyhealth.com or visit the City’s website at nridgeville.orgfor more information. Also, the Ohio Tobacco Quit Line offers free tobacco and coaching service to help you quit using all forms of tobacco. To enroll, call the toll-free Quit Line at 1-800-QUIT-NOW (784-8669). (a) Smoking, as defined in Chapter 506, of the Codified Ordinances, and the use of smokeless tobacco products is hereby prohibited in any areas of any Oberlin Park, as defined in Section 927.00, as may be established by the City Manager as non-smoking and tobacco-free zones. (1) No person found to be smoking or using smokeless tobacco products in such designated non-smoking and tobacco-free zones in a park shall fail to immediately cease said activity when requested to do so by City staff, a Police Officer, or a person charged with the management, operation or care of any City-owned park, including any baseball or softball umpire or soccer official. (2) Should a person found to be smoking or using smokeless tobacco products in a non-smoking and tobacco free zone in a park not immediately cease said activity when requested to do so, as described in subsection (a)(1) hereof, he or she shall be guilty of a minor misdemeanor. (3) Persons who repeatedly violate this section, may be permanently banned from City Parks. On May 29, 2012, HUD issued a noticed that strongly encouraged Public Housing Authorities to implement smoke-free policies in some or all public housing units. No later than 18 months of the effective date of HUD's Final Rule of February 3, 2017, each PHA must implement a "smoke-free" policy banning the use of prohibited tobacco products in all public housing living units, indoor common areas in public housing, and in PHA administrative office buildings. Effective May 1, 2018, the Lorain Metropolitan Housing Authority (LMHA) will officially become a smoke-free environment. Smoking will not be allowed in common areas, resident units, offices and within twenty-five (25) feet of all doors and windows. Smoking will only be allowed in designated areas. The Lorain Metropolitan Housing Authority is implementing this policy because we are concerned with secondhand smoke and the affect it has on the health of our residents and the community. On November 15, 2016, we began the "We Care Healthy Homes Initiative" campaign to have a smoke-free environment. By going smoke-free, we are improving the overall health of the community, reducing tenant complaints, and reducing maintenance cost. There is no safe level of secondhand smoke exposure because smoke drifts throughout a building. It can enter through ceiling crawl spaces, light fixtures and walls, and seeps under and around doors. Ventilation systems do not protect families from secondhand smoke. Most air filter systems are designed to remove odors, not the toxic particles from tobacco smoke. The Environmental Protection Agency (EPA) lists secondhand smoke as a Class A Carcinogen, the most toxic class of chemicals that are known to cause cancer in humans. Secondhand smoke is the leading trigger of asthma attacks and other respiratory problems and a known cause of Sudden Infant Death Syndrome (SIDS). Even though smokers feel that it is their right to smoke in their units, there is no Federal or State law that prohibits a property owner from implementing a smoke-free policy for their buildings or grounds and there is no legal right to smoke in federally subsidized housing. Smoke-free policies do not infringe on the legal rights of individuals because smokers are not a protected class under any state or federal law. Smokers may feel that it is their constitutional "right to smoke," which is untrue since the U.S. Constitution does not extend special protection to smokers, because there is no fundamental right to smoke. Fair housing laws do not apply to smokers, but they may be applicable when secondhand smoke infiltrates non-smoking housing units. Inhaling, exhaling, burning, or carrying any lighted cigar, cigarette, pipe, or other lighted smoking devices for burning tobacco or any other plant. The first letter was sent to residents in December 2016 to inform them of the policy change. A second letter will be sent in January 2017 reminding them that the policy will begin May 1, 2018. It will also inform residents that all lease holders must sign a lease addendum. We Care Healthy Homes Initiative information should be provided to all applicants. LMHA shall post non-smoking signs at entrances and exits, in common areas, and in conspicuous places adjoining the grounds of the Non-Smoking Area. Signs are prominently placed to let residents and guests know there is no smoking in the buildings. "This is a smokefree building" signs are placed by the door outside the building. "No smoking" signs are in the lobby, community room, office and any other common area. If, in LMHA's sole discretion, the property size and configuration allow, LMHA may designate and clearly identify a specific outdoor area where smoking is permitted. If a designated area has not been identified at the property, then smoking shall be permitted at least 25 feet away from any window or door of the LMHA structure. If a designated smoking area is established, smoking on the premises must be confined to and occur only within that designated smoking area. The policy will be effective May 1, 2018. Smoking in an apartment is treated like any other lease violation. If the violation persists, a termination notice can be issued. First Offense: Staff will send the resident a reminder of the Smoke-Free Policy to include a copy of the Smoke-Free Lease Addendum signed by the resident household, linkage to cessation services and their resident services representative. A referral should also be completed to refer the resident to their resident services representative for assistance in complying with the SmokeFree Policy. Second Offense: Staff will visit the household to investigate a suspected violation of this Policy. Evidence will be gathered by looking for signs of smoking, including stains on the walls, ash trays inside the unit and burn marks. Staff will document where tobacco and other plant smoke odors are present inside the building and take pictures where appropriate. All unit inspections due to witnessed or reported smoking violations will be documented in writing even if evidence is not collected or found. Staff witnesses a resident, resident's guest, or family member, service provider, or other person smoking within the unit or within 25 feet of the building. "Other person" is defined as "an invitee or guest of the tenant, the tenant's family or otherwise on the premises with the knowledge of the tenant or member of tenant's family." Staff witnesses a lighted smoking product in an ashtray or other receptacle in the unit or within 25 feet of the building. Damages to the interior of LMHA units that are the result of burns caused by smoking products including burns to resident owned property. Evidence of smoking in a unit such as cigarette or other smoking products smells, smoke clogged filters, smoke film including damage to walls. Repeated reports to staff of violations of LMHA's Smoke-Free policy by third parties. Clogged plumbing caused by a smoking product or products. Any other evidence of smoking in a LMHA unit. Staff will send the resident a written letter of the findings of their inspection and second reminder of the Smoke-Free policy including a copy of the Smoke-Free Lease Addendum signed by the resident household, linkage to cessation services and their resident services representative. Resident will be advised that further lease violations will result in further action, up to and including Termination of the Lease. Third Offense: Staff will send the resident a letter to attend a mandatory conference to discuss the policy and repeated violations. When feasible both the property manager and resident services representative will be present for the conference to assist the resident in developing strategies to help them comply with the policy in order to safeguard their housing. During this conference, the resident will be required to sign a last chance agreement. If the resident fails to attend the conference or sign the last chance agreement, the resident's file will be documented accordingly. Fourth Offense: Staff will issue a 30 day notice of lease termination. The resident is still afforded their right to request a hearing according to the grievance procedure. Resident Service Coordinators will provide residents with training to assist residents to stop smoking. We understand how difficult it is to quit smoking so they will work with the Lorain County General Health District to offer smoking cessation programs. They will coordinate special meetings where residents will receive information on the risk of secondhand smoke. LMHA's adoption of a smoke-free living environment, and the efforts to designate the rental complex as smoke-free, do not make LMHA or any of its managing agents the guarantor of Tenant's health or of the smoke-free condition of the Tenant's unit and the common areas. However, LMHA shall take reasonable steps to enforce the smoke-free terms of its leases and to make the complex smoke-free. Landlord is not required to take steps in response to smoking unless Landlord knows of said smoking or has been given written notice of said smoking. Disclaimer. LMHA's adoption of a smoke-free living environment, and the efforts to designate the rental complex as smoke-free, does not in any way change the standard of care that the Landlord or managing agent would have to a Tenant household to render buildings and premises designated as smoke-free any safer, more habitable, or improved in terms of air quality standards than any other rental premises. Landlord specifically disclaims any implied or express warranties that the building, common areas, or Tenant's premises will have any higher or improved air quality standards than any other rental property. Landlord cannot and does not warranty or promise that the rental premises or common areas will be free from secondhand smoke. Tenant acknowledges that LMHA's ability to police, monitor, or enforce this policy is dependent in significant part on voluntary compliance by Tenant and Tenant's guests. Tenants with respiratory ailments, allergies, or any other physical or mental condition relating to smoke are put on notice that Landlord does not assume any higher duty of care to enforce this policy than any other landlord obligation under the Lease. The Smoke-Free policy will improve the condition of individual units and it will eventually reduce the turnover cost related to smoke related damages. It will provide site staff with equal access to a smoke-free work environment and most importantly it will create healthier communities. in all campus facilities or on campus grounds being used for private events. Tobacco products are permitted for use in Tappan Square, except during public events. Portable electronic vaporizers are not permitted for indoor use but are permitted for outdoor use at least 30 feet from campus buildings. Portable vaporizers may not to used during outdoor, public events like Commencement. The use of tobacco products in Tappan Square and the outdoor use of portable electronic vaporizers will be reevaluated in 2018.
within or upon any outdoor areas owned by the Village, whether or not open to public access, including but not limited to parks, recreational areas, parking lots, and the grounds of public buildings, but excluding sidewalks within the public right of way. Section 2. The Council finds and determines that all formal actions relating to the adoption of this Ordinance have been taken at open meetings of this Council; that the deliberations of this Council and its Committees, resulting in such formal action, took place in meetings open to the public in compliance with all statutory requirements, including the requirements of section 121.22 of the Ohio Revised Code. Section 3. That this Ordinance shall take effect at the earliest period allowed by law. Ohio voters passed Issue 5 on November 7, 2006, creating Ohio's indoor smoking ban under a new chapter of the Ohio Revised Code (ORC) effective December 7, 2006. This law requires "public places" and "places of employment" to prohibit smoking as of that date. These businesses and organizations must also post "No Smoking" signs that contain the telephone number 1-866-559-OHIO (6446) for reporting violations. Local health districts throughout Ohio and the Ohio Department of Health are responsible for enforcing the Smoke Free Workplace Law. The enforcement process began on May 3, 2007 and is performed on a complaint basis. Click here to view the final draft of OAC 3701-52 [http://codes.ohio.gov/oac/3701-52]. LCPH manages the enforcement and education of the smoking law in Lorain County. While most establishments in Lorain County follow the law, we still receive some reports of illegal smoking. To report a smoking violation, call the Ohio Department of Health at 1-866-559-OHIO. Your name is not needed when filing a smoking a complaint. Smoking can cause high blood pressure – borrow a blood pressure kit from your local library.